What is the best Hadoop training online available today? That’s exactly what this article will attempt to answer. Covering a range of available online courses, from scheduled tutor led instruction to video based training we will help you orientate the many options open to you. For our findings at a glance, just head to the table below. For an in depth review of each of our selected Hadoop training courses, plus a detailed analysis of what you should expect from your online training, keep on reading. It is self-evident that one needs to be well trained in order to be able to setup, deploy, manage, and optimize a Hadoop system. There are various courses whose curricula are designed to allow their learners to become competent Hadoop specialists and gain employment. These courses use educational technology and standard tutorials/lectures to train the learners. Additionally, educational technology allows these courses to be offered either online or as a classroom-based course. Online courses are of the same quality as their classroom-based counterpart. Still, before one starts the training, it is mandatory that one has a basic understanding of the Linux file system and Java programming. Also, one needs to choose whether (s)he wants to be trained as a Hadoop administrator or a Hadoop developer. The best way to learn hadoop online is to choose a high-quality hadoop course. Choosing the best hadoop online training available allows one to learn Hadoop as well as earn a Hadoop certification which helps one to secure a job as a big data specialist. What makes the best big data certification? Still, what makes an online course as a good Hadoop Certification Training course? The answer is the course curriculum and the quality of training. A curriculum that covers the entire breadth of the Hadoop ecosystem, starting from Big Data basics (including identifying the drivers of such big data), Hadoop basics, Hadoop architecture (HDFS and MapReduce), how to write MapReduce codes, and how to process data using the most common Hadoop-related software such as Pig, Hbase, Hive, Oozie and Spark. Also, the course trainer must be ready to offer practical assistance when needed. Likewise, the course must offer ample practical sessions and demos of how a Hadoop ecosystem needs to work in a real-life environment. Also, the certification offered must be recognized by the relevant Hadoop or Big Data specialist(s) registering bodies. Other things to consider are the length (duration) and cost of the course. Using the above criteria, 5 of the best hadoop online training courses have been identified for review. From these 5 courses, the best way to learn hadoop online is identified. This is a high-quality online Hadoop developer training course designed to use live and interactive online sessions to provide the learner with a firm theoretical foundation as well as practical hands-on knowledge of the entire Hadoop ecosystem so that one can become a competent Hadoop developer. This course places much emphasis on ensuring that the learner has a good understanding of how to setup and use the Hadoop architecture, MapReduce, Oozie, Flume, Hive, Pig scripting, and the Apache workflow scheduler along with Sqoop, Zookeper, and Hbase. This course uses industry-based case studies for formulating projects for the learner. This allows the learner to have a firm theoretical foundation of the Apache Hadoop framework, as well as hone their practical skills in terms of setup, deployment and management of Hadoop systems to manage big data. This course is offered by the premier online technology academy, Collabera TACT, which has partnered with Google Developer as their authorized training partner. Also, it is part of the PartnerWorks Consultant Community. Successful completion of this course earns one a Big Data Hadoop Developer Certification that is recognized and valued in the Big Data market. This course aims to train one on how to program Hadoop and connect it to Hadoop-optimizing applications so as to build and deploy a fully-optimized Hadoop ecosystem. The knowledge and ideas learned are designed to build proficiency in management of Big Data using an open-source Hadoop platform, and for this reason it incorporates advanced modules such as Zookeeper and YARN. However, are there any pre-requistes to enrolling for this course? According to Collabera-TACT, the potential learner needs to have an understanding of basic Java programming and Linux file systems. Still, those who lack this knowledge can still enroll, but they must first complete a self-paced complementary bridging course that offers Java tutorials so as to acquire the required Java skills for opertaing a Hadoop ecosystem. Afterwards, one can join the course. The main course objectives are stated hereafter. To begin with, this course aims to train the learner on how to write complex and error-free MapReduce (that is, Mapper, Reducer, and Driver) codes on YARN (Yet Another Resource Negotiator) which comes bundled with Apache Hadoop version 2.0 and later versions. One learns how YARN allocates computing resources across the cluster by running 2 daemons called application manager and resource manager, which manage 2 critical tasks, progress monitoring (of slave daemons/NameNodes) and job tracking. The learner is given practical lessons on how to write program codes on MapReduce engines, both MRv1 and its successor, MRv2. Likewise, one is taught what the Hadoop architecture is, and how it operates, as well as trained during practical sessions on how to setup a fully-functional core Hadoop framework whose architecture is optimized for big data handling. Another key objective of this course relates to the Hadoop ecosystem. First of all, one is introduced and familiarized with the entire Hadoop Ecosystem. Then, the learner is trained on how to perform data analytics using the Apache-Hive Data Warehouse platform. Likewise, one is taught how to write high-level scripting programs via Apache Pig using its Pig Latin programming language. Additionally, the learner is trained on how to utilize advanced Hadoop-optimizing programs such as Apache Flume for managing log data and Apache Oozie for workflow scheduling in the Hadoop system. The learner is also trained to lay Hbase on top of the Hadoop HDFS and then how to use for fault-tolerant storage of sparse data. Additionally, the learner is taught how to work on real-life industrial-grade projects. An additional key objective in this course is training the learner how to troubleshoot a Hadoop system. Likewise, the learner acquires hands-on expertise with regards to configuring the applications in the Hadoop cluster, and this aids in both trouble-shooting and system optimization. The course outline provided by Collabera-TACT reflects the course objectives. This course outline may vary from batch to batch, but in general; in follows the schedule described hereafter. To begin with, the learner is introducing to the Linux File System, and how to use a Virtual Machine (VM). For this reason, a learner without prior knowledge of Linux system, but with basic understanding of Java, can directly join the course. Afterwards, the course proceeds to Big Data, where it is defined and Big Data drivers identified alongside an in-depth description of the 5Vs of Big Data. This is followed by HDFS lectures which allows the learner to understand how the Master-Slave architecture works, and how to write and read data from an HDFS cluster. This is then followed by theoretical lectures on MapReduce, and afterwards, practical lessons on how to create and use a MapReduce code are provided. This allows the learner to proceed to lessons dealing with Higher Level Abstraction for MapReduce where (s)he learns how to use Apache Pig and Apache Hive with MapReduce. Afterwards, the course proceeds to NoSQL databases with the introductory lessons providing the theoretical foundations of these databases, and then the proceeding lessons dealing with the practical aspects of how to use NoSQL databases along a Hadoop ecosystem to manage Big Data. After the aforementioned lessons have been covered, the course proceeds to the software used in Hadoop ecosystem. At this point, the learner is taught how to use the following softwares with Hadoop; Sqoop, Impala, Oozie, Spark, Cassandra, Mongo, and Flume. Afterwards, the learner is introduced to Hadoop administration with the practical lectures focusing on how to manage a Hadoop cluster on an Amazon AWS-EC2 (Elastic Compute Cloud), as well as how to manage the cluster using Amazon Elastic-MapReduce (EMR). There is also a theoretical lecture on pseudo-distributed deployment mode of a Hadoop system. When these lectures are completed, the learner is given a project to complete, and if the project is completed successfully alongside other tests, then certification follows. The entire course is comprised of 42hours of online lecture and training sessions. The course offers lifetime access to the tutorials for the learner through its leaning management system (LMS). Gives the learner an in-depth knowledge about Big Data. Equips learner with skills to write MapReduce code. Offers lessons on Hadoop administration. Training requires 42hours of live interactive sessions. Requires one to have basic Java programming skills. The Collabera-TACT Big-Data Hadoop Developer Training is a high-quality training course designed to use live and interactive online sessions to provide the learner with a firm theoretical foundation as well as practical hands-on knowledge of the entire Hadoop ecosystem so that one can become a competent Hadoop developer. It gives the learner a firm understanding of how to create and use a Hadoop architecture with MapReduce, Oozie, Flume, Hive, Pig scripting, Apache workflow scheduler, Sqoop, Zookeper, and Hbase. The course uses industry-based case studies for formulating projects for the learner. The quality of training and use of course design that eases the process of knowledge-acquisition makes Collabera-TACT Big-Data Hadoop Developer Training the best way to learn Hadoop online. This is a well-paced, high-quality online Hadoop developer training course designed to use live interactive online sessions to enable the learner to gain a firm theoretical foundation as well as practical hands-on knowledge of the entire Hadoop ecosystem so that one can become a competent Hadoop developer. The lessons are offered in 2 package terms; the ordinary instructor-led live online sessions which last for 60hours, and the discounted early bird-offer. Emphasis is placed on ensuring that the learner has a good understanding of how to setup and use the Hadoop architecture, MapReduce, Oozie, Flume, Hive, Pig scripting, and the Apache workflow scheduler along with Sqoop, Zookeper, and Hbase. This course uses real-life case studies, assignments, and practicals to enable the learner have a firm theoretical foundation of the Apache Hadoop framework, as well as hone their practical skills in terms of setup, deployment and management of Hadoop systems to manage big data. This course is offered by Edureka. Successful course completion earns one a recognized and valued Big Data Hadoop Developer Certification. The knowledge and ideas learned are designed to build proficiency in management of Big Data using an open-source Hadoop platform, and for this reason it incorporates advanced modules such as Zookeeper and YARN. According to Edureka, the potential learner is at advantage if (s)he understands Core Java, Basic SQL and the Linux File System, but this is not mandatory as one can be taught these in introductory and complementary courses, especially the self-paced complementary bridging course that offers Java tutorials. The key course objectives are described hereafter. To begin with, this course aims to train the learner on how to write complex and error-free MapReduce codes on YARN which comes bundled with Apache Hadoop version 2.0 and later versions. One learns how YARN allocates computing resources across the cluster via the application manager and resource manager, which manage 2 critical tasks – progress monitoring of slave daemons and job tracking. The learner is given practical lessons on how to write program codes on MapReduce engines, both MRv1 and its successor, MRv2. Likewise, one is taught what the Hadoop architecture is, and how it operates, as well as trained during practical sessions on how to setup a fully-functional core Hadoop framework whose architecture is optimized for big data handling. Learning about the Hadoop ecosystem is another key objective. First of all, one is introduced and familiarized with the entire Hadoop Ecosystem. Then, the learner is trained on how to perform data analytics using the Apache-Hive Data Warehouse platform. Likewise, one is taught how to write high-level scripting programs via Apache Pig using its Pig Latin programming language. Additionally, the learner is trained on how to utilize advanced Hadoop-optimizing programs such as Apache Flume for managing log data and Apache Oozie for workflow scheduling in the Hadoop system. Furthermore, the learner is trained to lay Hbase on top of the Hadoop HDFS and then how to use for fault-tolerant storage of sparse data. Additionally, the learner is taught how to work on real-life industrial-grade projects. The course outline provided by Edureka reflects the aforementioned course objectives. The basic course outline is described hereafter. To begin with, the learner is introduced to Big Data, where it is defined and Big Data drivers identified alongside an in-depth description of the 5Vs of Big Data. This is followed by HDFS lectures which allows the learner to understand how the Master-Slave architecture works, and how to write and read data from an HDFS cluster. This is then followed by theoretical lectures on MapReduce, and afterwards, practical lessons on how to create and use a MapReduce code are provided. Afterwards, the course proceeds to Hbase tutorials where the learner is trained on how to best use Hbase with a Hadoop cluster. Thereafter, one is trained how to use Spark and Oozie with Hadoop. The entire course is comprised of 60hours of online lecture and training sessions. The course offers lifetime access to the tutorials for the learner through its LMS. Training requires 60hours of live interactive sessions. Requires one to learn about SQL before starting the course. 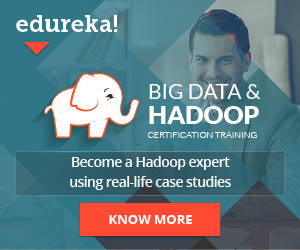 The Edureka Big-Data Hadoop Certification Training is a well-paced, high-quality training course designed to use live-interactive online sessions to enable the learner to gain a firm theoretical foundation as well as practical hands-on knowledge of the entire Hadoop ecosystem so that one can become a competent Hadoop developer. Its lessons are offered in 2 package terms; the ordinary instructor-led live online sessions which last for 60hours, and the discounted early bird-offer. This is a well-paced, high-quality online Hadoop developer training course that uses 50 hours of instructor-led training and 9 real-time industry-related case studies/projects as the basis for awarding the learner with a Cloudera Big-Data CCA175 certification. It focuses on Hadoop 2.7.x and later versions. Emphasis is placed on ensuring that the learner has a good understanding of how to setup and use the Hadoop architecture, MapReduce, Oozie, Flume, Spark, Graphx, Hive, Pig scripting, and the Apache workflow scheduler along with Sqoop, Zookeper, and Hbase. This course is offered by Intellipaat. Successful course completion earns one a recognized and valued Cloudera Big-Data CCA175 certificate. According to Intellipaat, the potential learner is at advantage if (s)he understands Core Java, Basic SQL, and UNIX/Linux File Systems, but this is not mandatory as one can be taught these in introductory and complementary courses, especially the self-paced complementary bridging course that offers Java tutorials. The key course objectives are described hereafter. To begin with, this course aims to train the learner on how to write complex and error-free MapReduce codes on YARN which comes bundled with Apache Hadoop version 2.7 and later versions. The learner is given practical lessons on how to write program codes on the MRv2 MapReduce engine. Likewise, one is taught what the Hadoop architecture is, and how it operates, as well as trained during practical sessions on how to setup a fully-functional core Hadoop framework whose architecture is optimized for big data handling. Additionally, the learner is trained on how to utilize advanced Hadoop-optimizing programs such as Apache Flume for managing log data and Apache Oozie for workflow scheduling in the Hadoop system. It also allows the learner to handle data in AVRO format. Furthermore, the learner is trained to lay Hbase on top of the Hadoop HDFS and then how to use for fault-tolerant storage of sparse data. Additionally, the learner is taught how to work on real-life industrial-grade projects. Also, one is trained how to deploy and manage Hadoop on amazon EC2. The course outline provided by Intellipaat reflects the aforementioned course objectives. The basic course outline is described hereafter. To begin with, the learner is introduced to Big Data, where it is defined and Big Data drivers identified alongside an in-depth description of the 5Vs of Big Data. This allows the learner to proceed to lessons dealing with Higher Level Abstraction for MapReduce where (s)he learns how to use Apache Pig and Apache Hive with MapReduce. Afterwards, the course proceeds to Hbase tutorials where the learner is trained on how to best use Hbase and Oozie with a Hadoop cluster. One is also trained how to use Spark, Mllib, Graphx, and Spark-RDD to write Spark applications. Afterwards, the learner is introduced to Hadoop administration with the practical lectures focusing on how to manage a Hadoop cluster on an Amazon AWS-EC2. The entire course is comprised of 50hours of online lecture and training sessions. The course offers lifetime access to the tutorials for the learner through its LMS. Focuses on Apache Hadoop 2.7.x and later versions. Training requires 50hours of live interactive sessions. Offers a recognized Cloudera Big-Data CCA175 certificate. The Intellipaat Big-Data Hadoop Certification Training Course is a well-paced, high-quality training course that uses 50hours of instructor-led training and 9 real-time industry-related case studies/projects as the basis for awarding the learner with a Cloudera Big-Data CCA175 certification. It focuses on Hadoop 2.7.x and later versions. This is a well-paced, high-quality, and budget-friendly online Hadoop developer training course that is designed to use 17hours on-demand videos, 4 articles, and 42 supplemental resources to provide the learner with a firm theoretical foundation as well as practical hands-on knowledge of the entire Hadoop ecosystem so that one can become a competent Hadoop developer. Emphasis is placed on ensuring that the learner has a good understanding of how to setup and use the Hadoop architecture, MapReduce, Oozie, Flume, Spark, Hive, Pig scripting, and the Apache workflow scheduler along with Sqoop, Zookeper, and Hbase. This course uses real-life case studies and assignments to enable the learner have a firm theoretical foundation of the Apache Hadoop framework, as well as hone their practical skills in terms of setup, deployment and management of Hadoop systems to manage big data. This course is offered by Hadoop In Real World via the Udemy online platform. Successful course completion earns one a recognized certificate. According to Hadoop In Real World, the potential learner is at advantage if (s)he understands Core Java and Basic SQL, but this is not mandatory as one can be taught these in introductory and complementary courses, especially the self-paced complementary bridging course that offers Java tutorials. Still. One must understand , the Linux file system. Learning about the Hadoop ecosystem is another key objective. First of all, one is introduced and familiarized with the entire Hadoop Ecosystem. Then, the learner is trained on how to perform data analytics using the Apache-Hive Data Warehouse platform. Likewise, one is taught how to write high-level scripting programs via Apache Pig using its Pig Latin programming language. Furthermore, the learner is trained to lay Hbase on top of the Hadoop HDFS and then how to use for fault-tolerant storage of sparse data. Additionally, the learner is taught how to work on real-life industrial-grade projects. Also, one is trained how to deploy and manage Hadoop on cloud services such as Amazon AWS and EC2. The course outline provided by Hadoop in Real World reflects the aforementioned course objectives. The basic course outline is described hereafter. Afterwards, the course proceeds to Hbase tutorials where the learner is trained on how to best use Hbase and Oozie with a Hadoop cluster. One is also trained how to use Spark and related software to write Spark applications. Afterwards, the learner is introduced to Hadoop administration with the practical lectures focusing on how to manage a Hadoop cluster on an Amazon AWS-EC2. The course offers lifetime access to the tutorials for the learner through its LMS. Lifetime access to Udemy Hadoop in Real World LMS. Mandatory for one to be well-versed with Linux commands. The Udemy Hadoop Developer In Real-World Course is a well-paced, high-quality, and budget-friendly online Hadoop developer training course that is designed to use 17hours on-demand videos, 4 articles, and 42 supplemental resources to provide the learner with a firm theoretical foundation as well as practical hands-on knowledge of the entire Hadoop ecosystem so that one can become a competent Hadoop developer. This is a well-paced, high-quality, and budget-friendly online Hadoop administrator training course that is designed to train the learner how to install, configure, and support a Hadoop cluster. It is based on the HortonWorks certification program, and this allows it to offers Hadoop administrator training that allows the learner to manage a cluster using the HortonWorks Data Platform (HDP). Its certification exam to correctly solve 5 (or more) of the 7 practical tasks given. This exam lasts for only 2hours. Training emphasis is placed on ensuring that the learner has a good understanding of how to setup and use the Hadoop architecture, MapReduce, Oozie, Flume, Hive, Pig scripting, and the Apache workflow scheduler along with Sqoop, Zookeper, and Hbase. Another area where emphasis is placed is on deployement of the Hadoop to a cluster. This course is offered by Whizlabs Software Pvt. Limited. This course aims to train one on how to program Hadoop and connect it to Hadoop-optimizing applications so as to build and deploy a fully-optimized Hadoop ecosystem. The knowledge and ideas learned are designed to build proficiency in management of HDP clusters. According to Whizlabs, the potential learner is at advantage if (s)he understands Core Java, Basic SQL and the Linux File System, but this is not mandatory as one can be taught these in introductory and complementary courses, especially the self-paced complementary bridging course that offers Java tutorials. The key course objectives are described hereafter. To begin with, this course aims to train the learner on how to write complex and error-free MapReduce codes on YARN, and how these codes can help the administrator manage the cluster. The learner is given practical lessons on how to write program codes on MapReduce engines. Likewise, one is taught what the Hadoop architecture is, and how it operates, as well as trained during practical sessions on how to setup a fully-functional core Hadoop framework whose architecture is optimized for big data handling. Then, the learner is familiarized on how to perform data analytics using the Apache-Hive Data Warehouse platform. Likewise, one is familiarized about writing high-level scripting programs via Apache Pig using its Pig Latin programming language. Additionally, the learner is trained on how to utilize advanced Hadoop-optimizing programs such as Apache Flume for managing log data and Apache Oozie for workflow scheduling in the Hadoop system. Most importantly, one is trained on how to deploy a cluster and installing the hadoop cluster using SSH tunnel. The course outline provided by Whizlabs reflects the aforementioned course objectives. The basic course outline is described hereafter. This allows the learner to proceed to lessons dealing with Higher Level Abstraction for MapReduce where (s)he learns how to use Apache Pig and Apache Hive with MapReduce. Afterwards, the course proceeds to Hbase tutorials where the learner is trained on how to best use Hbase with a Hadoop cluster. Thereafter, one is trained how to use Spark and Oozie with Hadoop. Then, one is trained on how to deploy and install a HDP cluster on an Apache Server using SSH tunnel, and managing access and rights of users to this cluster. The Whizlabs HDPCA Certification is a well-paced, high-quality, and budget-friendly online Hadoop administrator training course that is designed to train the learner how to install, configure, and support a Hadoop cluster. Hadoop is a Java-based software platform specially built to manage the processing and distributed storage of big data. This open-source platform has been developed by Apache Software Foundation as a cross-platform software framework to operate a distributed file system. This platform is at the core of a large programming framework called the Hadoop ecosystem which manages big data within a scalable distributed computing environment. The internet has revolutionized the way data is created and managed. During the pre-internet age (pre-1980), dedicated workers were employed to input structured data into a computer system, and this data was stored in a database whose data entry, retrieval, and manipulation operations were managed by a dedicated software called a database management system/software (DBMS). With the advent of internet and mobile telephony, large volumes of data were created, with the velocity of data creation rising exponentially with the advent of smartphones and social media. During this internet age, anyone can create data using either computer software or mobile application, with social media allowing people to create large amounts of unstructured data, that is text, videos, and gifs among other data types. In fact, in every 60seconds, over 340,000tweets are created and 300hours of video are uploaded to YouTube. It is not only humans who are generating data now as machines also have the capacity to create and send data over networked systems. These machines are include Internet-of-Things and advanced Artificial Intelligence (for instance, there are computer software that can identify and name tumors from MRI, CT and PET scans even when human experts cannot identify these tumors). These large amounts of complex data sets cannot be handled by the standard on-hand DBMS, and for this reason they are collectively designated as called Big Data. A stand-alone database and DBMS cannot process big data because of its size, complexity and speed of generation. Still, how can one identify big data? IBM has attempted to answer this question by creating the 4Vs to identify and describe big data. According to these 4Vs, large Volumes (V) of different types (Variety) of data are created at a very rapid rate (data Velocity), and this data need to be stored so that Value can be extracted from it as well as determine how much of this data is accurate and free from inconsistencies (data Veracity). Therefore volume, variety, velocity and value are the 4Vs that identify big data. Big Data cannot be stored in a stand-alone database, and because this data sometimes need to manipulated in real-time, an extremely large storage capacity and very high computer processing power are required. To solve this issue, a distributed storage system was created. In this system, several computers (called servers) act as data stores. However, how can data be transmitted from the users to this distributed storage system, and how will the storage system allocate data to the different servers? This requires a special software called a Distributed File System (DFS) which takes the user-generated Big Data and then breaks it down in a specific format into data blocks, and then uses a logical algorithm to distribute these data blocks across the different servers. The computer which hosts the DFS is called the master node, while the servers which store the data are called the slave nodes. The slave nodes are connected to each other, as well as each slave node is connected to the master node hence creating a single system of connected or networked computers called a computer cluster. Related Content: What is Hadoop and why is it so important? Hadoop was inspired by a paper published in 2003, called the Google File System; alongside another paper published by Google which dealt with a programming framework called MapReduce. Apache used ideas from these 2 papers to power a project called Apache Nutch, of which one of its sub-project called Hadoop was detached from it in 2006 and then developed as a full project called Hadoop 1, which was later developed into Hadoop 2, with the most recent stable release being Hadoop version 2.8.0 which rebutted in March 2017. Hadoop 2.8.0 has 2 core components; the storage system called the Hadoop Distributed-File-System (HDFS) and a processing component based on the MapReduce programming model. The operations of Hadoop are complex and one needs to be trained well on how to manage Hadoop-controlled computer clusters. Even so, the basic operation of Hadoop is described below. Basically, Hadoop provides a software framework that allows Big Data sets to be stored and processed in a parallel and distributed manner. HDFS uses the master-slave architecture of the DFS. In HDFS, the master node (or master daemon) is called the NameNode, which manages and maintains the slave nodes/daemons (called DataNodes), as well as records metadata of each data block that is sent to be processed by the DataNodes. The DataNode stores as well as processes a data block. Each DataNode receives instructions from the NameNode, and it also sends information about its state (that is, if it is working fine or if it experiencing a crash). The process of a DataNode informing the NameNode about its health is called heartbeat. There is also another master node machine called the Secondary NameNode which is both a backup of the NameNode as well as frees the resources of the NameNode by allowing the merging function of the edit log into a fsImage. In the NameNode, there are 2 files called the fsImage which has all the metadata of the data blocks alongside the modifications that this metadata has undergone since the project was initiated. Meanwhile, metadata modifications occurring in real-time are stored in another file called the edit log which is usually stored in the RAM of the NameNode machine. These 2 files are then moved to the Secondary NameMode where they are merged, in a process called check-pointing, into a new fsImage which is then transferred back to the NameNode. The HDFS has a high fault tolerance each data block is replicated. HDFS uses a replication factor to create 2 replicas from the original data block and then storing these replicated data blocks in different slave nodes, and therefore if the DataNode that has the original Data Block crashes, the data is never lost as it is quickly recovered from either of the replicated data blocks. So how does HDFS write (that is, store) data into the DataNodes, and also how does it read (that is, retrieve) data from the DataNodes? HDFS write mechanism, including multi-block write mechanism, uses a pipeline setup which one needs to know how to setup and manage. One also needs to know how the read mechanism works. Likewise, one needs to understand how the write and read architecture works. MapReduce is the programming framework that manages the data processing in a distributed and parallel format across the computer cluster, and in the process merging the processing power of the entire cluster into a supercomputer architecture. In MapReduce, the main program, called Job Tracker, is hosted in the NameNode; and when data blocks are created, a corresponding package code, called Task Tracker, is created by MapReduce for each block. Therefore, each data block is moved alongside its package code into a DataNode. Still, one must write the MapReduce code so that it can handle the data being processed. This code is written in 3 sets in Java language. These sets are the Mapper code, Reducer code, and Driver code. One needs to learn how to write and run these codes. Computing resources in the cluster are managed using a module called Hadoop YARP. Likewise, additional software can be connected to the Hadoop system so as to optimize, and also improve the efficiency of data storage, data access, data processing, operations, data security, and data governance. These additional software along with the Hadoop system create a Hadoop Ecosystem. Some of these additional softwares include Apache Pig, ZooKeeper, Flume, Spark, Apache Hive, Sqoop, Storm, Oozie, Phoenix, Apache Hbase, and Cloudera Impala. One needs to be well-versed with these softwares in order to run a fully-optimized Hadoop system. Likewise, Hadoop can be deployed in one of the following 3 deployment modes; the local/standalone mode (usually for development of MapReduce code), pseudo-distributed mode (for testing the MapReduce code on a Hadoop system), and the fully-distributed/cluster mode (for running Hadoop to manage Big Data). The main benefit of online training is that you can do it from anywhere you have a laptop and internet connection. The Hadoop courses reviewed above are available to students all over the world, with many of them proving extremely popular for those based in India. For those looking for the best Hadoop training in Hyderabad or places such as Bangalore; online opportunities are very often the best big data certification programs you can follow. And once fully trained the option to work remotely for many global businesses is an extremely attractive position to be in. So best of luck with your future. After completing one of the above big data training programs you will be well on your way to achieving your career goals, no matter your destination.